Conscious evolution matters because it is the world view that currently gives us the greatest sense of hope, direction and impulse to participate in healing and evolving our world by realizing our full potentials. As we see reality, so we act. As we act, so we tend to become. Conscious evolution provides us with a spiritual base of oneness not only with the eternal, but with the evolving aspects of creation. It aligns us socially with the dynamic progressive universal tendency of what Sri Aurobindo called the Consciousness Force itself. As the new world view of conscious evolution is emerging, current narratives of reality are fading in the modern world. Biblical literalism, inevitable progress through more knowledge, reductionist scientism, the power of global corporations, political parties, international organizations, organized religions to guide us are literally evaporating, delegitimatized by failure. We cannot look to current leaders, dominant world views, or structures of any existing institutions to guide us. The guiding directions for modern civilaition are coming from a deeper source within civil society, within the mass movements for sustainability, social justice, peace, spirituality, and the realization of emerging possibilities. 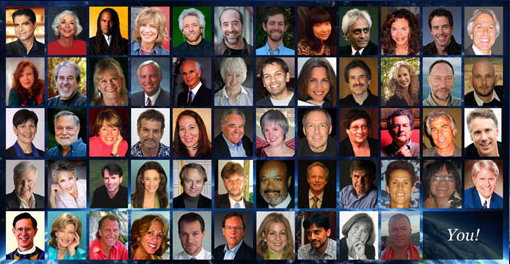 Countless millions are being called into compassionate, sacred and inspired action, to heal, to prevent further tragedies, to innovate and transform. Global emergencies are calling forth global emergences. The conscious evolution world view is beginning to coalesce in an evolutionary movement of pioneers, a movement of movements, that seeks to connect that which is emerging and empathetic in every field and function. It is a world-wide movement toward a phase change, a world shift, a higher order of synergy and harmony, perhaps a more synergistic democracy in which each person is encouraged to give and be their best. At its growing edges the evolutionary movement is tending toward a new convergence. it is “the new mainstream.” It is consciously aligning with nature’s tendency to form more comprehensive whole systems through greater synergy of separate parts. Social networking is connecting us. The global brain/heart is fostering empathy and offering us unprecedented global intelligence through the maturing “noosphere,” the mind sphere of Earth. Just as the environmental, financial and political systems are breaking down, greater connectivity,coherence and synergy is arising. The key question is planetary timing. Do we have time to enter the downward spiral of devolution with effective strategies and projects of conscious evolution? We do not know for sure. We have never seen another planet go through its high technology, over-populating, polluting, warring phase toward ethical conscious evolution. However, i believe that the answer is Yes, we can..because it is the nature of nature to innovate and transform through greater synergy. This is a multi-billioin year trend! To accelerate social conscious evolution, I see the need for a “Wheel of Cocreation” symbolizing our turn on the spiral of evolution. 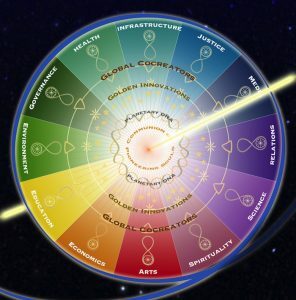 This Wheel is composed of every vital organic function within the social body, such as health, education, environment, economics, science and technologies, media and the arts, etc. It arises at every level from local to global. The Wheel is a new social architecture for social synergy that empowers people to connect to cocreate. It facilitates synergistic convergence, attracting people to join together in vocational clusters and entrepreneurial teams to seek common goals and match needs with resources in the light of the growing potential of the whole system. The Wheel constantly selects for what is working, a natural process of evolution itself. Everyone who enters the Wheel through creative action helps to turn the Wheel, not toward repetition of what has gone before but toward the emergence of what has never been. We become cocreators of our future, a species literally capable of healing the Earth, freeing ourselves from deficiencies, shifting from war to conscious evolution as we explore the vast the vast potentials of inner and outer space. Conscious evolution gives us the sense of direction and guidelines learned from how nature has been and is now evolving to act as agents of positive change throughout the world. It helps us to develop a vision of our future as the next turn on the spiral of evolution. From the perspective of conscious evolution, we sense that not doing this alone in a neutral universe but rather the universe is evolving through all of us toward a more comprehensive, harmonious whole system of greater freedom and consciousness. In this sense the “Star of the Evolutionary Play” is the sacred and invisible process of creation Itself, or Spirit, God, acting within us toward life ever-evolving. Humanity is in a race between consciousness and catastrophe. We are fast moving into a world in systems crisis and we are challenged to be collectively aware of where we are, who we are, and where we are going. The potential for profound conflict and great damage to our future is very real, so it is vital that we pay attention individually and collectively. If we do not mobilize our collective capacity for conscious evolution as a human community, we will likely veer off into a new dark age as a species and may never fulfill our evolutionary potentials. Our supreme test is to live sustainably on the Earth, in harmony with the rest of life on this planet, and in gratitude with the living universe. The changes required of humanity at this time are so broad, so deep, and so far reaching that it is vital that we be as wide-awake and conscious as possible in this time of global transition. When we are in service to Conscious Evolution we individually and collectively take responsibility for our future destiny by transcending the limitations of our past human existence. When we are fully conscious of the fact that we affect our own evolution by everything we do this awareness helps us take an evolutionary leap into our next stage of existence. Once our evolution accelerates we soon find ourselves in a field unity consciousness and we begin to align with others in a collective vision. When this happens positive change begins to unfold in a seemingly effortless way. Conscious Evolution represents a fundamental change in humanity’s relationship with the Evolutionary Impulse. And how we hold the relationship to something or someone vastly impacts our behavior. If we think that evolution is solely random, that we have no effect on it, or that there is no evolution and God fixed us in time, we see ourselves as having no power. We are afraid, angry, passive, violent and greedy. Conversely, if we see ourselves and the planet we are on as part of a living universe, all of which is continuing to grow and evolve, we are called into a relationship with Life as partner, as co-creator, as Love, Lover and Beloved. We are moved to be as thoughtful, as kind, as clear-seeing, as compassionate as if we and it and each other are sacred. This requires all of our skill, education, experience, centering, wisdom and love. Life is not just happening to us, we are the expression of Life evolving. What we do makes a difference. How we are with ourselves, each other and Life itself determines how that Life will evolve. All acts have consequence. When we understand that our actions impact our world, we can begin to choose different actions. If we can see that our actions result from belief systems we once held as true but no longer serve, we have the option to step outside of them. Conscious Evolution gives us a larger framework in which to see our participation in the cosmic drama unfolding around and through us. We have come to the wall of the consequences of our past actions in such a way as to propel us into a new level of maturity, the same right of passage facing the adolescent. It’s time to grow up and take responsibility for our future, to put away childish things (ideas, perspectives) and think like an adult, to step outside of what no longer works and embrace a larger worldview. Our choice is to consciously participate with evolution as it is happening and decide what our intentions, attentions and actions are in relationship to it. Conscious Evolution demands that we be partners with the process of evolution—not helpless children or submissive slaves—but partners who give and receive, listen deeply and act responsibly. We can choose how we participate—with denial, fear, and hate or love, gratitude and grace– but evolution is moving through us, the change is happening, we are in the midst of it and our actions have consequences for the outcome. This change in our belief system or worldview is as major as the movement in human consciousness from thinking the sun revolved around a flat earth to recognizing that our earth is one of many planets revolving around the same sun. We can choose to play our part in the larger unfolding. We can choose to midwife the birth of a new way of being with Life while also graciously helping the old ways to die by skillful hospicing. Our choice. When we become conscious of the mysterious drive to evolve – in constantly reaching beyond what we already know and what has already been created – and when this mysterious drive to evolve becomes conscious of itself through us, it radically displaces a fundamental sense of separate and of limitation that was assumed to be an inherent part of being human. And in its place, emerges the extraordinary positivity of the drive to create a better and better world. Our passion to create a better future is free from boundaries – not only from the boundaries that cynicism creates, but also from the boundaries of any static idea of what kind of future we can create. The interest in conscious evolution that is free from boundaries and attachment to the status quo, makes it possible for us to come together in creative and new ways that were not possible before. It matters because no less than the survival of the human race is at stake. Conscious evolution matters because it represents the means, or at least the unfying idea by which we can begin to positively impact the future of both human cutlure and the larger destiny of life on Earth. But it may extend beyiond that as well. Indeed, we have no idea what impact our emerging power to shape and choose our own destiny will ultimately have not only on ourselves and our planet, but on larger processes beyond our current comprehension. But it could be significant. The moral implications, for all we know, may be off the scale. So it just might be a good idea to think big. A little bit of the right kind of self-inflation, the kind that crushes our petty concerns with the weighty burden of a cosmic sense of responsibility, might serve our species well at this moment in history. A sense of that kind of proportion could be just what we need. It could help us find the courage and creativity to take the reins of destiny—to exercise our evolutionarily empowered capacity for agency, assess our situation, and consciously evolve. There is a force and field of Life sweeping through the hearts and minds of millions throughout our world right now, calling us to awaken to our power to consciously evolve in ways that are going to matter most. As our ancestors were compelled to cross unknown seas, and brave new worlds in search of a better future for themselves and their children, so too are we being called to venture forth into unknown territory in order to secure a brighter tomorrow for ourselves and those yet to come. However, rather than oceans and prairies, the new terrains beckoning us are consciousness and human society, as we are called to forge new pathways that will empower us to midwife into the manifest world the unmanifest potentials present for goodness, care, integrity and co-creativity. As it has become clear that we will be unable to solve our problems at the same level of consciousness at which they were created, we are compelled towards our own development as never before, aware that the clock is ticking and much is at stake. The consequences of having developed technologically and scientifically far faster than we have developed morally, spiritually, psychologically and socially is about to catch up to us, and threatens to cause unbearable levels of suffering unless rectified quickly. Humanity is at a crossroads. The perilous unsustainability of our current civilization’s way of life has brought us to a stark, existential choice: evolve or die. Yet our survival, while certainly at stake, is only the pre-condition, not the essence, of our impulse to consciously evolve. That impulse, the enlightenment drive, the vital force that through the green fuse of our lives is driving the flower of our awakening, is poised not against death but rather against a catastrophic failure to realize the infinite potential that is our own true nature, the real gift of this precious and sacred incarnation we now, for this moment, enjoy. Our future need not be what simply happens to us as the result of current, mechanical, seemingly unstoppable trends. “Trend,” after all, “is not destiny.” Where perceived possibility and a sense of responsibility for its realization meet, where love and will meet to give imaginative vision the power of intention, we have the creative basis for a better world, one that both inwardly and outwardly reflects our best human selves. Life , as the complexity theorists see it is a dynamic balance of two forces, one that preserves existing forms and another that constantly creates new forms. Conscious evolution can be viewed as a process of recalibrating ourselves toward the creative side of this equation just as the “stable,” habitual side has lost the life it had and is becoming most in need of creative destruction to make way for new life. We can see this playing out at this very time in the place where some believe our civilization was born, in Egypt. The world is watching a youthful, self-organized uprising in Cairo’s Tahrir or Liberation Square, just across the Nile and a short distance from Giza where the great Sphinx gazes open-eyed toward the dawn of each new day, perhaps an icon of the rising light of consciousness itself. There is some scientific evidence that this great stone icon predates Egyptian civilization by many millennia and may hearken back to the time of Atlantis. Now, on TV, we are seeing a new dawn. A youthful demonstration on behalf of freedom and the dignity of life has spontaneously erupted against a tyrannical regime that justifies itself purely on the basis of the “stability” it claims as its raison d’etre. The demonstrators have shown their willingness to face death if that is what is needed to prevail against this external tyranny. Yet, in our profound sympathy with them, we also intuitively sense at the heart of their movement, so open-ended, pure and devoid of ideology as it is, a hope for freedom as well from internal tyranny, from all that limits the full expression of the human spirit. And this is the hope, the aspiration, that lies at the heart of conscious evolution. How can something be so important to us that it trumps our survival, so valued that we would willingly sacrifice our lives for it? Plato asked himself this very question. What is it, he wondered, that moves some of us more powerfully than either reason or desire, that makes us put our lives on the line time and again even though it seems manifestly unreasonable, and death is the antithesis of satisfying our desires. The answer he came to was thymos, which Hegel later translated as recognition. When the dignity and sacredness of our lives is ignored, is not recognized, is oppressed by those who aim to dominate and exploit us, we rise up against their superior force to gain that recognition. Thus, as Hegel saw, recognition is the driving force of human history seen as a long series of revolutions to obtain liberation. But finally even having the dignity of everyone’s life recognized and respected by all others, the aim of democracy (which Francis Fukayama prematurely viewed as the end of history) is not enough. The evolutionary impulse that is driving us now is toward collective self-recognition of our unconditioned and limitlessly creative true nature, as evolution conscious of itself. This transformation, this divinization of ourselves and of our world into a condition of wholeness, harmony, and luminous aliveness (Aquinas’s three aspects of beauty: integritas, consonantia, and claritas) is our destiny. What could matter more? The healthy continuity of our species depends on radical changes in consciousness and action taking place in a very short span of time. Conscious evolution is the process through which we awaken not only to a deepened perspective on our place in an unfolding history, but also become active allies to that which is being born within us in this birth canal of crisis and opportunity. Ultimately, it is the full application of our will power in service and surrender to the highest potentials of our species.